He planned Operation Valkyrie for the overthrow (I didn’t understand what Valkyrie really was. But then I saw that it was actually a composition made by Wagner named Valkyrie). 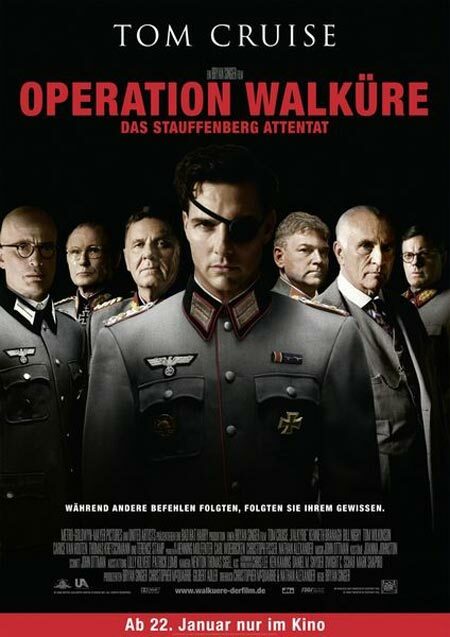 Operation Valkyrie was about to make the reserve army take over the country right after Hitler is dead. So, to set this operation, they had to kill Hitler first (Too bad, I’d already known the ending right after I knew the mission was about to kill Hitler. The mission was failed. That’s because I know that Hitler wasn’t dead on 1944. But I still wanted to see their strategy). But there was change of plan. They’re not gonna just kill Hitler, but they wanted to kill Himmler too. But that must be done in 1 action. They wanted to kill them both with bomb. For maximum damage, like everyone in the room’s dead, they need to blast the bomb in high pressured room like in a closed room. They planned to do the murder trial at Hitler’s bunker at Wolf’s Lair. And then came the chance to do it. It was when Stauffenberg came to briefing at Wolf’s Lair. There was Hitler and Himmler. But the thing is the briefing wasn’t held at the bunker because of that day was a little bit too hot. It’d make the bomb don’t give the maximum damage. So, yeah, the bomb blew out. And Stauffenberg was so sure that Hitler’s dead (I don’t understand whether Stauffenberg was really sure or just shamming to sure. You know, probably he didn’t really sure that Hitler was killed). Stauffenberg went back to Berlin and start the coup. He spread the news that Hitler’s dead. He ordered the reserve army to arrest Gestapo & SS official. At the beginning, this plan was running well. But then Hitler, which wasn’t killed, sent command to arrest Stauffenberg as he discovered that Stauffenberg did the murder trial. And yeah, the movie ended up with Stauffenberg & friends shot to death. Not surprising. Ah why history lesson in not composed in movies? I wish history lesson is like movies. I could understand a movie better than I read the history book. I could remember many things from the movie. Mmm, I could tell you that I like history, I guess. But maybe the thing that really interests me is the conspiracy. Oh, I love conspiracy so much. Col. Claus vion Stauffenberg is the real hero, isn't? An unready conspiration, but but the history wrote it with golden ink. Sometimes freedom need a great sacrifice. Operasi Valkyrie adalah operasi militer yang dirancang untuk meredam kerusuhan atau kekacauan dalam negeri. Operasi khusus ini dilakukan oleh pasukan Garda Dalam Negeri yang menjadi bagian dari Wehrmacht. Pembentukan pasukan ini didasari karena German selain bertempur di front Timur (Rusia), front Barat (Perancis, Normandia) dan front Utara (Afrika), German juga membuka front dalam negeri dimana lawannya adalah tentara partisan.